The short version is I didn’t back up my win from last week … ! 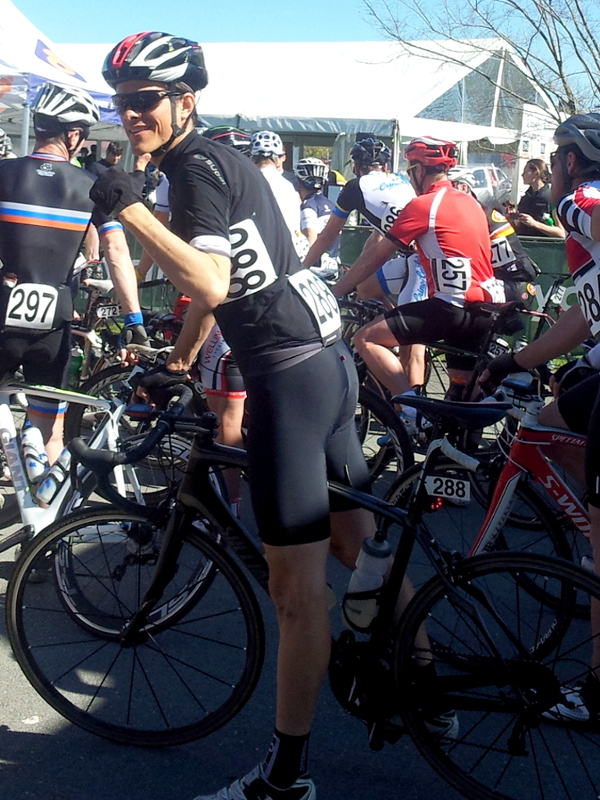 I’d been excited about the Sam Miranda Road Race on Saturday. With a 5km gravel climb in the middle, it looked like something I could stretch my legs on. Saturday came around and the weather was so good I took to the start line in Summer kit for the first time since Mt Buller. With KOM points on offer for three climbs I figured I’d go for these and then try to stay with the lead group to the finish, where I’d expect to come in at the back of a bunch sprint. 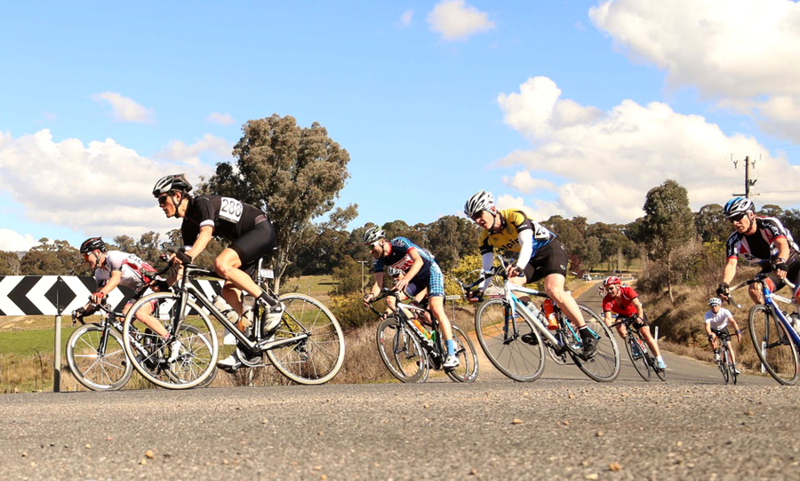 The bunch of 48 C-Masters riders held a mostly relaxed pace to the first KOM where I made the mistake of taking off too early. Several guys came past on the way up and though I hauled a few back before the top I finished outside the points. On the second climb I finished fifth, one place outside the points and I was beginning to feel stronger, knowing too that I’d do better on the longer gravel climb. But on the run down to the gravel, I made the mistake of falling back through the pack as others hit the small descent more aggressively. I moved in the bunch to reposition, then just metres short of the gravel I got myself caught in a dangerous position, clipping the wheel of the guy in front, and got flipped on to the floor. The elements which caused the crash came together suddenly, but it was my fault. I was trying to get around at a tight spot and should have stayed at the front from the previous KOM. 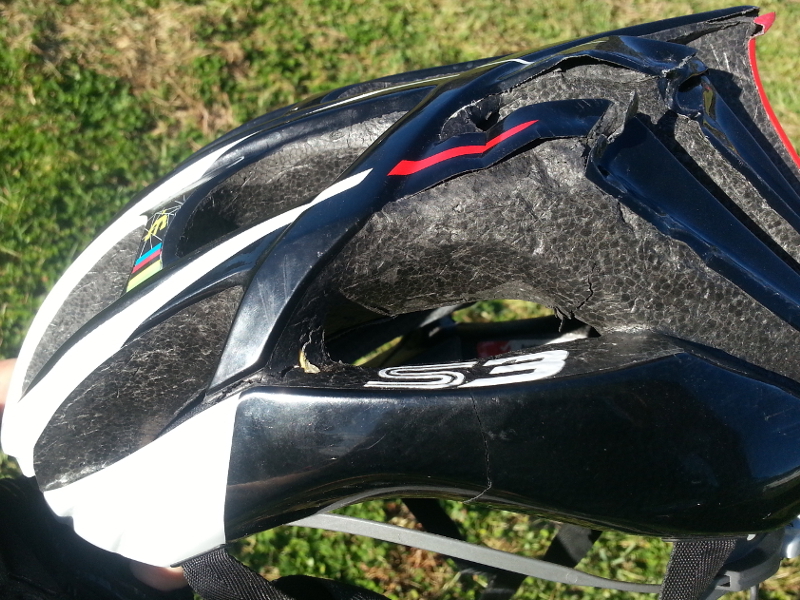 My head slammed into the road and I felt the impact of at least a couple of bikes against my body. I pulled myself up and assumed it was race over for me, though It was a great relief to see no one else got caught up in the crash. It took a couple of minutes, some beating on my shifters, and a talk with a commissaire, but I decided I would finish the race. Time to get a new helmet. I started passing riders up the gravel and looking at the Strava flyby I might not have been out of the running if I’d got back on without hesitation. So here’s a lesson, maybe. Get back on immediately, then decide if you can continue? Maybe then you can become the kind of guy who breaks a leg and goes riding in the mountains two weeks later? I stopped at the top and used a marshal’s phone to leave a message with Katrina – I didn’t want her to hear guys talking about the crash and not know what I was doing. Almost everyone I had passed on the climb came past at this point and I rolled down the descent on my own. Along the flat return leg I was able to work with a few guys, and then the leftovers of C Elite to stay remotely in touch. But I was getting a lot of pain from my wrist – I couldn’t hold the drops or lift my bidon with the injured side – and just a few kilometres from the end I dropped off. It was a solo roll across the line, eleven minutes behind the winner. Still, I’m glad I finished the distance despite the crash and minor injury. The time loss could have been worse too, and there were still a few others to arrive, presumably experiencing their own unanticipated battles. Weirdly, back at the ‘event village’ they had no first aid. Almost at the same time I asked for help a couple of guys clipped wheels and one crashed right at the line. A call was put over the PA for anyone with first aid skills and a well meaning health science undergrad looked at me, suggesting I go to the local hospital for a check. Katrina was concerned about concussion after seeing my helmet so we went to Wangaratta emergency where one of the women’s A graders was actually hurt, and where I tried to hum the theme tune to A Country Practice (I couldn’t really remember it). I was OK, but the organisers should improve their first aid set-up for future events. 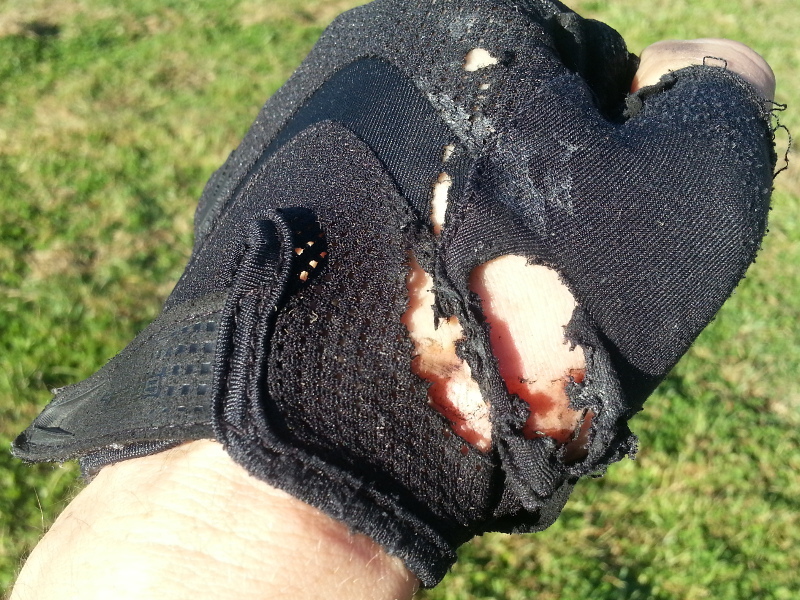 Time to get new gloves too! Katrina drove me home while I ate a whole packet of comforting raspberry liquorice (900 calories / 0 grams of fat) without regret. 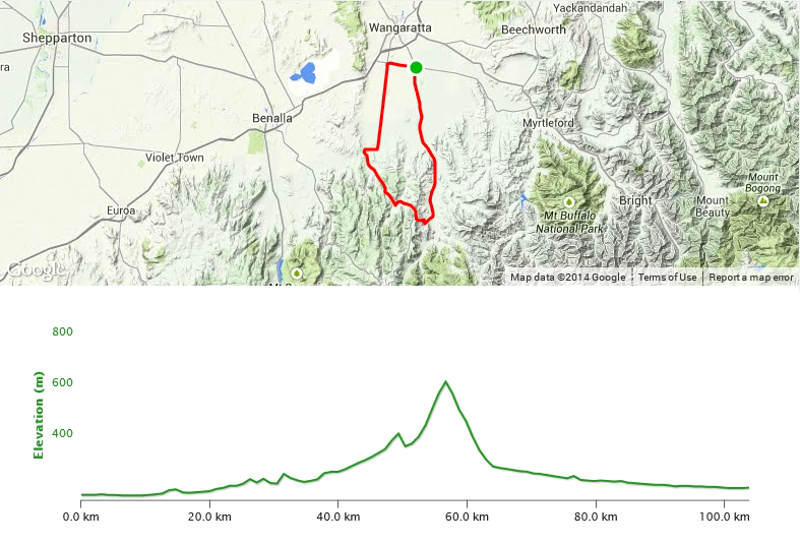 For what it’s worth, you can see the Strava file for my ride here.